We specialize where others loose focus and time. Our technologies have provided us a unique capability which allows our skilled labor to solve what matters most for your programs total success. We help you solve NPIs with more product/market planning allowing not only the Proto-typing to be more smooth but give your business the competitive jump it deserves. We live by our core values and waiver only for sake of improvement. We operate at an incredible efficiency unseen in our industry. The operational savings in cost and time provide you with the highest productivity in the space. We give our technology provided capabilities, directly to our clients. To get a sense of your manufacturing effectiveness, request your SMART EMS Production Handbook and track your programs “Return On Labor”. The study would provide you a meaningful metric to help gauge and guide you. 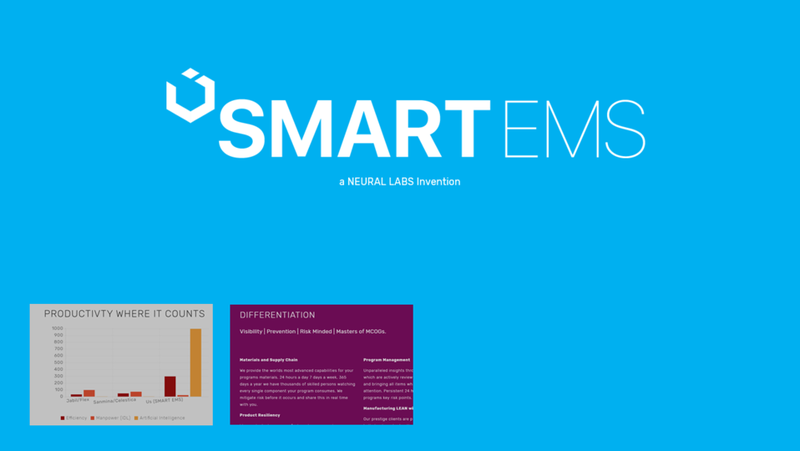 Our SMART EMS technology passes through to our clients both on MCOGS and in Reliablity. We lead and run programs with the help of A.I. where we should. This allows you the ability to work with a person focused only on the important factors which create a successful program. Want to know more about your Programs Health and learn methods and sound practices which can lead you and your current program from the negative to the positive? Reach out and purchase a Program Breakdown Comparison. We can locate and pinpoint topical areas where you can open dialog or use in selection criteria with us or others. Visibility | Prevention | Risk Minded | Masters of MCOGs. We provide the worlds most advanced capabilities for your programs materials. 24 hours a day 7 days a week, 365 days a year we have thousands of skilled persons watching every single component your program consumes. We mitigate risk before it occurs and share this in real time with you. We may be just your manufacturer however we know our place. It is to make certain WHAT you NEED is solved. So you can focus on your Products design, features and market conditions. We help de burden you with the multitude or issues you would face before you even start. The insights our platform can provide you can help you steer far clear of common pitfalls which others cannot see or forecast. Unparalleled insights through real-time team of skills which are actively reviewing every order, change request and bringing all items which you wish to be apart of to your attention. Persistent 24 hours a day access and scrutiny of programs key risk points. Our prestige clients are provided a concierge system which is tirelessly reviewing the possible waste in the manufacturing processes. It is reviewing live alternatives and strategies which are not present or sometimes seemingly illogical. Locations in each region which signifies cost conscious production. Yet we are capable of providing a hybrid on demand planning capability which is specific and unique to POWER EMS. As regulations, tariffs and other on controlled market turbulence, we are the most equipped to make rapid adjustments to help offset these changes you face. We internally monitor our own internal supply/demand to help us maintain the greatest cost benefits possible. As we compete for your business we need to be smarter than our competitors and use this superpower to out pace, out adjust and be ahead for you and us.